Target has the Rayovac Batteries for $1 in their Dollar Section. 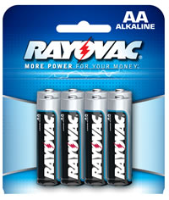 Plus there is a $1 off Rayovac batteries printable coupon (no size restrictions), making these FREE after the coupon! Please note, not all stores may carry these in the dollar section, it may vary by region. Many Walmart stores also carry these for $1, making these FREE after the coupon! *Note: Not all Walmart stores carry these. For all of the printable coupons and deals you can find them on the Hunt4Freebies Coupons and Deals Facebook Page Here!